By far the coldest air of the season will move into the Finger Lakes Monday with highs in the teens. High pressure north of the Upper Great Lakes will deliver a shot of very cold air to the Finger Lakes early this week. Temperatures are starting the first work-week of 2016 in the teens and single digits. The core of this cold air mass is located just north of Lake Ontario. 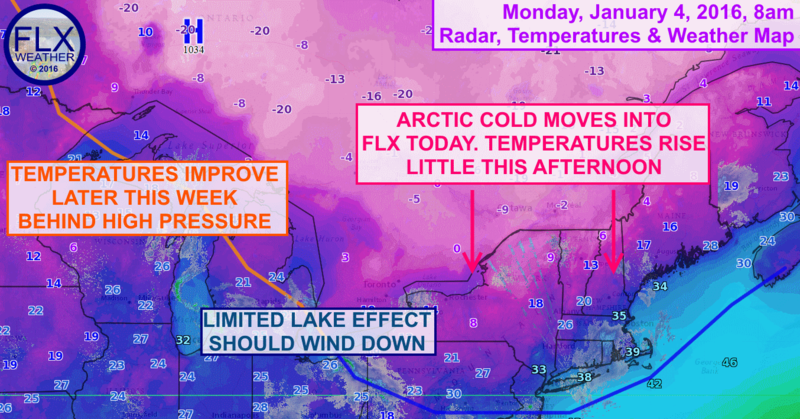 North winds ahead of the high pressure system will push this cold air into the Finger Lakes later today. As a result, temperatures will rise very little during the day today, despite increasingly sunny skies. Highs will top out in the mid teens for most areas. Lake effect snow is ongoing this morning, mostly near the shore of Lake Ontario and downwind of Cayuga Lake thanks to some Finger Lakes effect snow. This snow should gradually weaken this morning as high pressure suffocates the upward motion necessary for lake effect development. No other precipitation is expected the remainder of the work week as the high pressure system hangs around. The good news is that the low will transition from our northwest to our southeast. This will bring in some more comfortable temperatures, but not until a cold start to Tuesday as well. Morning lows Tuesday will vary by geographic location, but many places will drop into the single digits and a few sub-zero readings are not out of the question. Highs Tuesday will warm into the mid and upper 20s on southerly winds and sunny skies. Wednesday should be partly cloudy, with a 50-50 mix of sun and clouds on Thursday. Friday will likely end up mostly cloudy. High temperatures all three days should end up in the upper 30s. The weather this weekend will be a bit more interesting as a storm system moves in. At this point, it is not possible to tell what sort of precipitation may fall. More cold weather is ahead later next week.